This small picturesque park on the north side of Denman Island offers an idyllic location to enjoy a picnic and spend a quiet afternoon. The land that is now Fillongley Provincial Park was bequeathed to the province of British Columbia by George Beadnell, an Englishman who settled here at the turn of the century. Over the years, Beadnell developed Fillongley into one of the most beautiful estates in the Gulf Islands. A large, flat grassy field – once the site of a bowling green – comes alive with vibrant wildflowers in the spring. Set amongst a canopy of imported deciduous trees, this park is also noted for its beautiful display of colours in the fall. 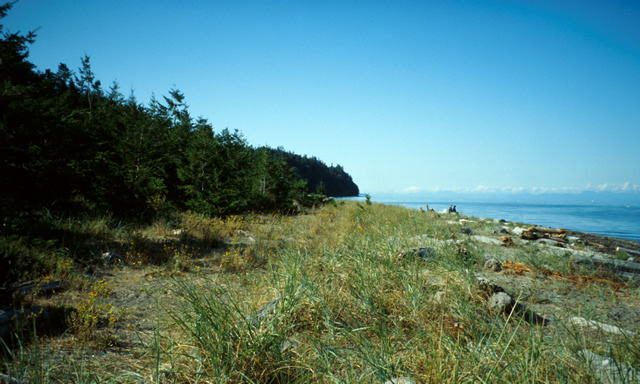 Ten campsites are located along the ocean, and there are several walking trails through the park where visitors can observe the old-growth cedar forest, a salmon spawning stream and remains of the old homestead. Fillongley only has 10 campsites and is usually full on weekends during the summer. We recommend having alternate camping plans on Denman Island in case this park is full. The nearest sani-stations are located at the Esso gas station in Cumberland or the Mohawk gas station in Courtenay on Vancouver Island. The closest boat launch is at Bill Mee Park, approximately 10 km away on East Road on Denman Island. Fillongley Park is located on Denman Island. Take the Denman Island Ferry from Buckley Bay, off Hwy #19a on central Vancouver Island. Take the Buckley Bay exit #101 from Hwy #19. Once on the island, follow Denman Road to Swan Road. Turn left on Swan Road, then right on Beadnell Road. Nearby communities include: Denman Island, Hornby Island, Buckley Bay, Fanny Bay, Comox Valley. History: Fillongley Park was once owned by George Beadnell, an Englishman who settled here at the turn of the century. Over the years, Beadnell developed Fillongley into one of the most beautiful estates in the Gulf Islands. Beadnell deeded the property to the provincial government in 1953 on the condition that they allow him to live out his days at his home here and they retain the name Fillongley. As a part of the transfer Beadnell, who died in 1958, wished to be buried on the property – today his gravesite can be seen along the Homestead Trail. Remains of his homestead are also visible, as are a number of unusual heritage trees that Beadnell imported from England and transplanted on the property. The flat meadow in the park was once the site of his bowling green. Conservation: Little George Creek, which flows through the park, is a salmon spawning stream. Please protect this delicate habitat. The park is also home to wildflower meadows and a variety of unusual trees that George Beadnell imported from England. Approved Master Plan [PDF] for Fillongley, Tribune Bay, Helliwell, and Sandy Island Provincial Parks. From Fillongley Park, paddlers can easily explore the waters around Denman Island and Hornby Island. Canoes and kayaks can set in at the beach at the campsites. There are opportunities for saltwater/ocean fishing in this park. Fishing is permitted as per provincial and federal fishing regulations. All anglers should check the current regulations issued by Fisheries and Oceans Canada prior to fishing. Anyone fishing or angling in British Columbia must have an appropriate licence. There are 2 km of wheelchair accessible walking trails through the park. One of these trails is a short loop from the parking area through the field (approximately 10 minutes to the field). Another trail heads west from the parking area and follows Beadnell Creek canyon through lush second-growth forest. This trail connects with Swan Road; visitors can return to the parking lot either back down the trail or along Beadnell Road. One-way walking time to Swan Road is approximately 30 minutes. There are opportunities for ocean swimming at this park, which has a sandy and pebble beach area; the water is quite cold. There are no lifeguards on duty at provincial parks. There are opportunities for windsurfing in this park. While fires are allowed, we encourage visitors to conserve the environment by minimizing the use of fire and using stoves instead. Campfire rings are provided at each campsite. Firewood can be purchased from the Park Operator. Fees for firewood are set locally and may vary. To preserve vegetation and ground cover, please don’t gather firewood from the area around your campsite or elsewhere in the park (this is a ticketable offence under the Park Act). Dead wood is an important habitat element for many plants and animals and it adds organic matter to the soil. You can conserve firewood and air quality by keeping your campfire small. Limited burning hours or campfire bans may be implemented. Bring a portable stove for cooking. A cold water tap is located approximately 50 metres from the campground. The tap is shut off during the off-season. This park has a one-hectare grassy field that is suitable for picnicking. Pit toilets and an information shelter are located at the parking area. This park has pit toilets, located at the parking area. This park offers 10 vehicle accessible campsites, located next to the beach. Each site has a picnic table and fire ring. During the summer, the campground very popular and is 100% reservable. This park offers winter camping but no services are available during the off-season; campers must be self-sufficient.